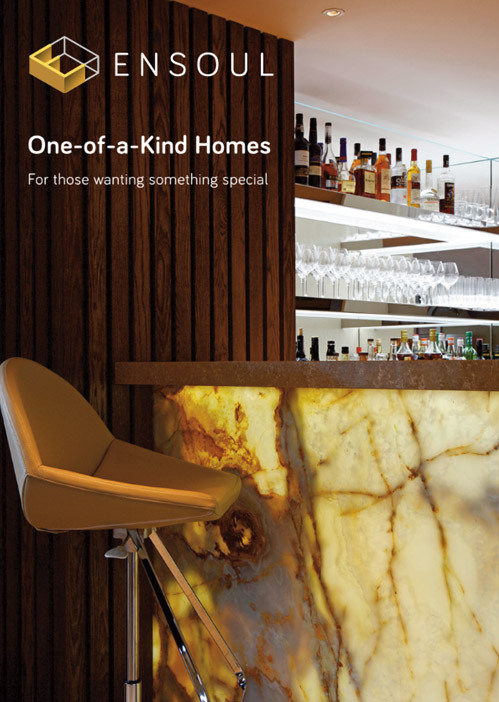 Stunning back lit Onyx bar with Quartz worktop. 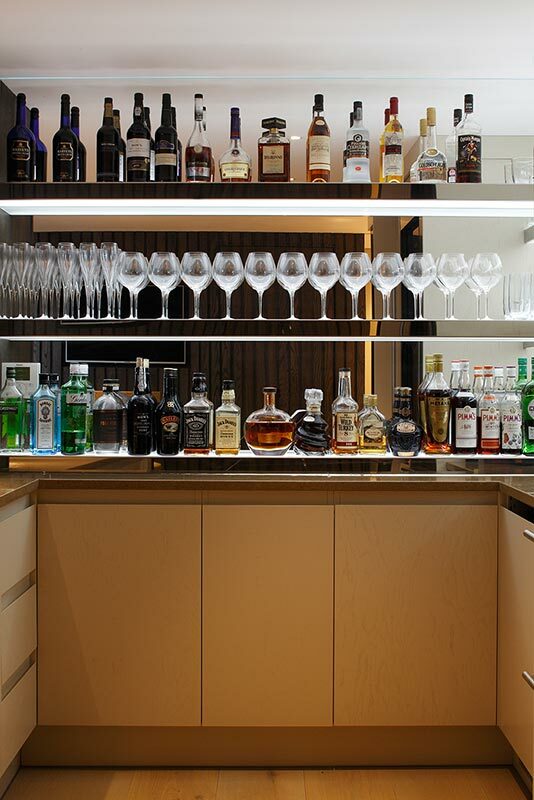 Stained Oak panelling on the walls meets glass shelving for bottles and glasses display. 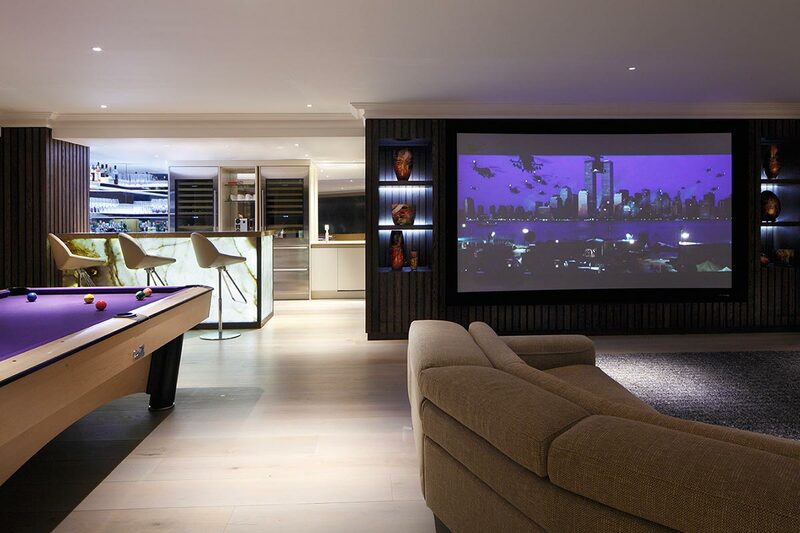 Beautiful bespoke home cinema at night time. Elegant formal sitting room / cinema room. Feature wall with electric fire, cut logs, surround sound speakers and open shelving. 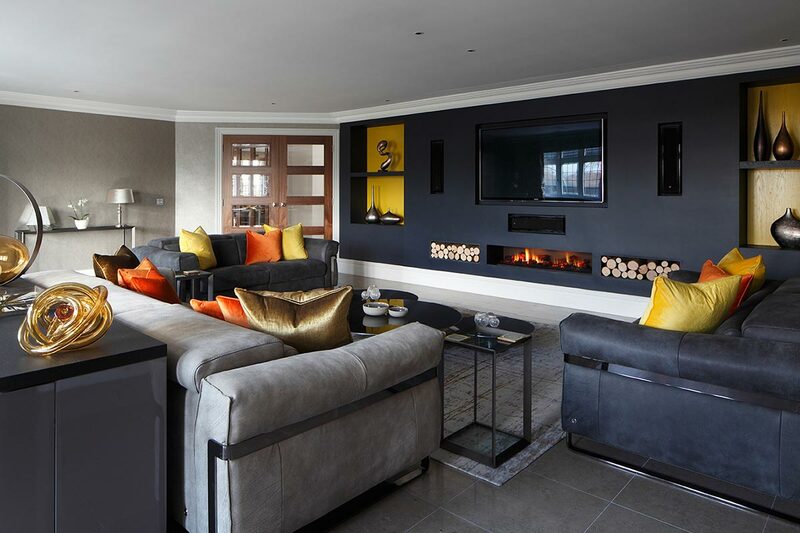 Leather reclining sofas with zingy orange and yellow scatter cushions. 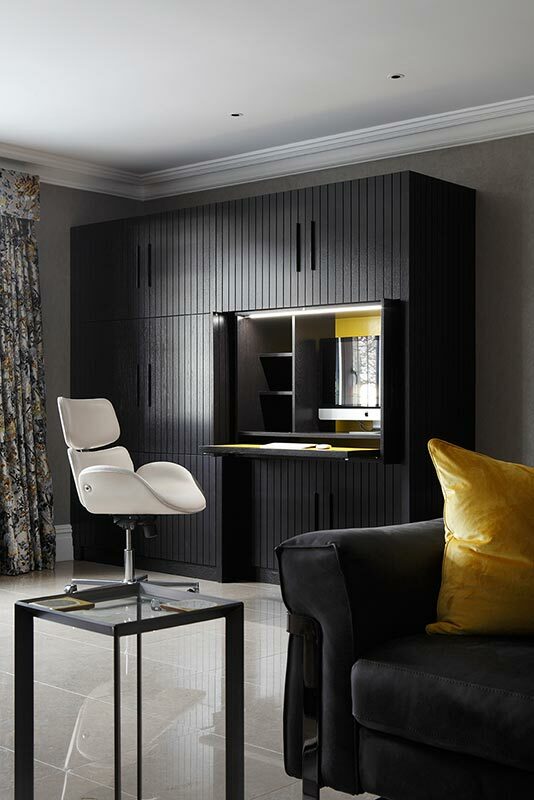 Bespoke, freestanding cabinet which when opened reveals an elegant home office. Features pocket doors and pull out desk. Elegant open plan kitchen, dining, lounge area. 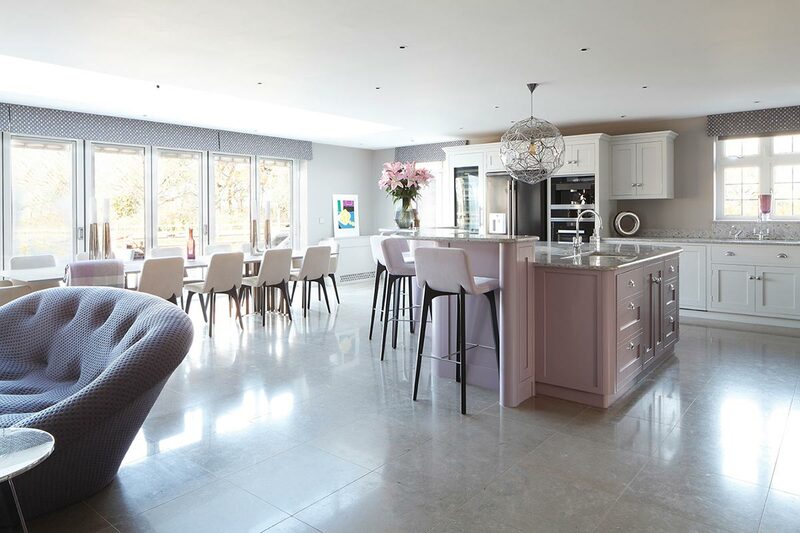 Panelled cabinetry in very pale grey and heather with light granite worktops and contemporary lighting. 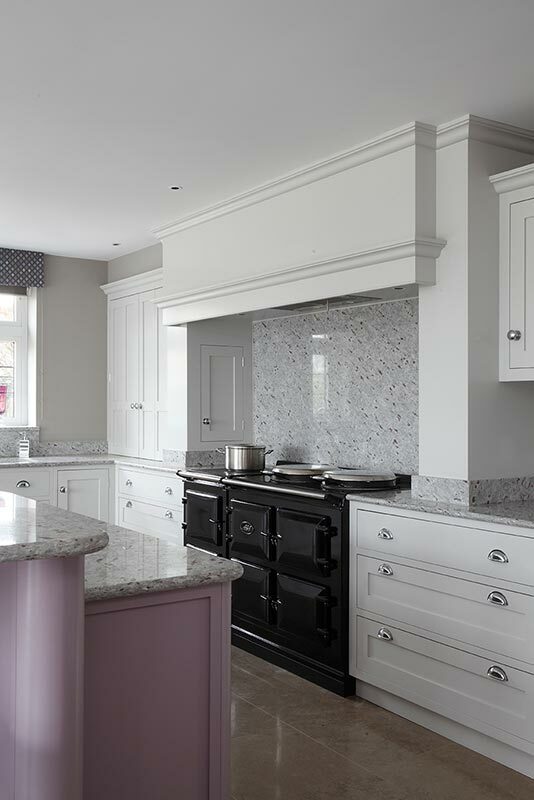 Beautiful kitchen with a black Aga, pale grey and heather painted shaker style cabinetry. Granite splashback. Elegant dining room featuring a bespoke 3 metre Calacatta marble table and bronze mirrored wall. 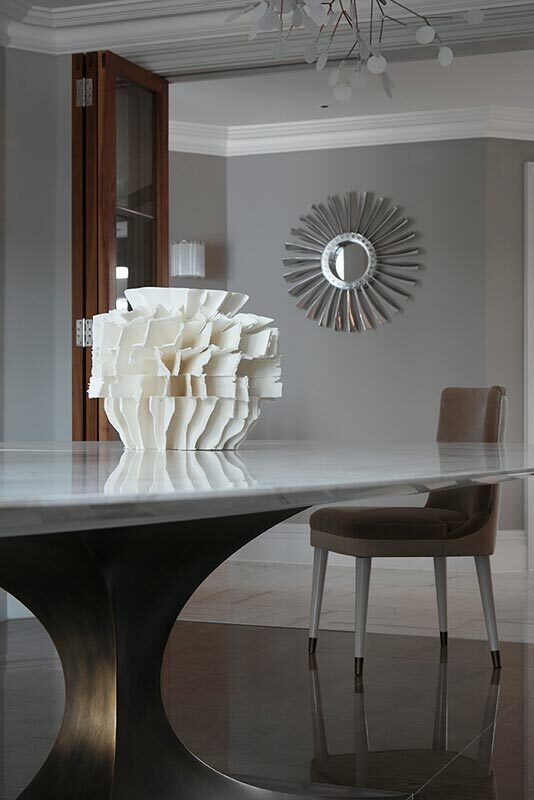 Elegant dining room with bespoke Calacatta marble dining table. Highly imaginative kids bedroom featuring a house style bunk bed with integrated slide to come down from the top bunk. The ceiling is hand painted with a sky and cloud effect. Kids playroom with bespoke cabinetry, open shelving and pull down play table. 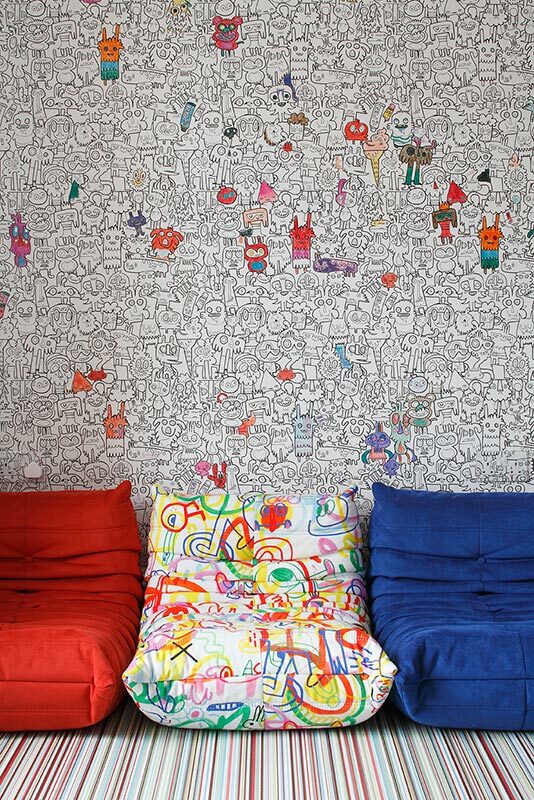 Fun, interactive kids space with colour-in wallpaper. At the foot of a master bed sits this beautiful veneer cabinet which stores a 40" TV which is on an uplift and rotate mechanism. Furnitecture at it's best. 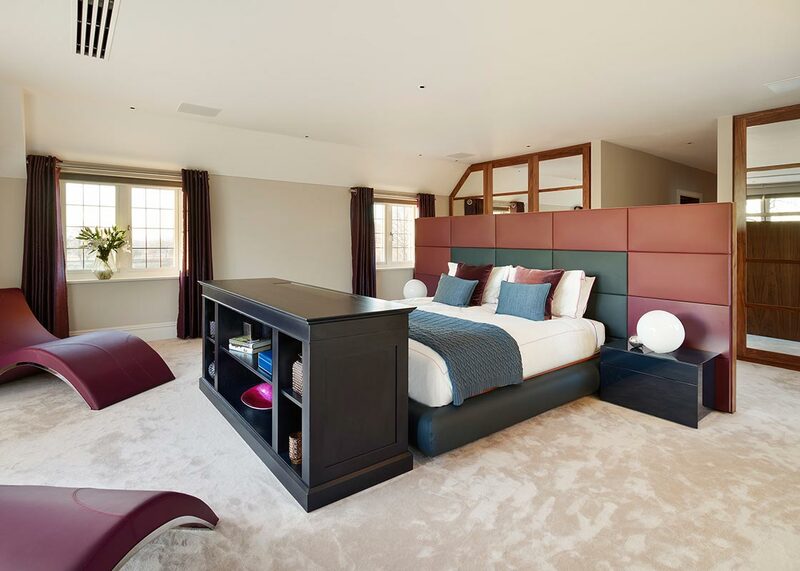 This impressive headboard is architected into the floor and is formed from a walnut block with leather upholstered panels to the front. 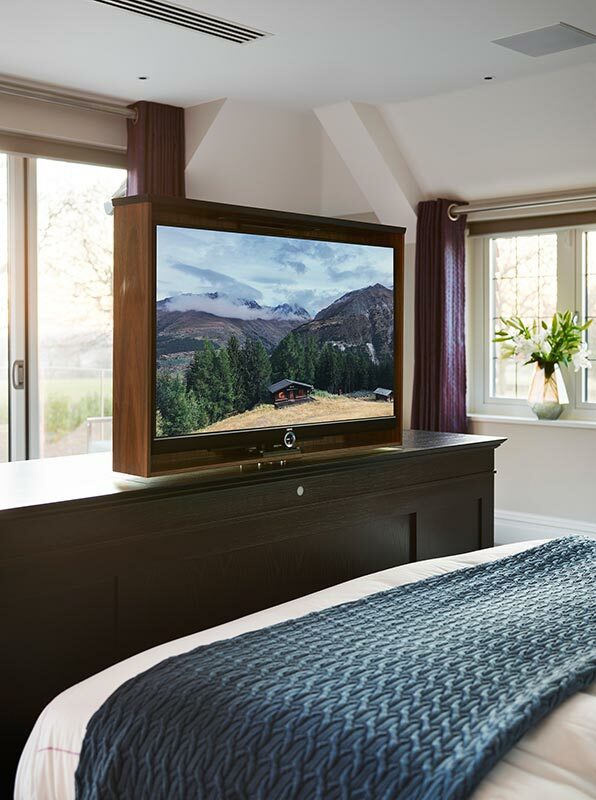 The cabinet at the end of the bed provides open shelving and stores a 40" TV on an uplift and rotate mechanism so that you can watch TV either in bed or on one of the leather chaise. 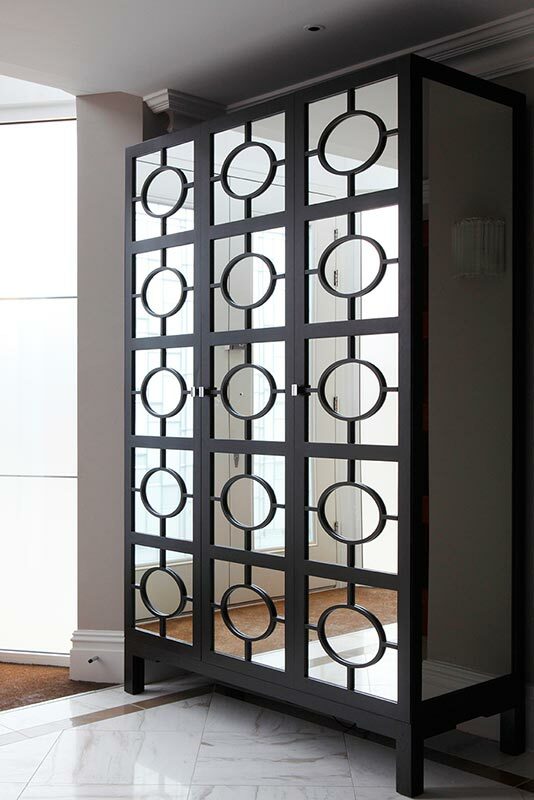 One aspect of a walk in dressing room which we designed and hand made as part of a luxury master suite. Made in walnut, glass and mirror with LED lighting. 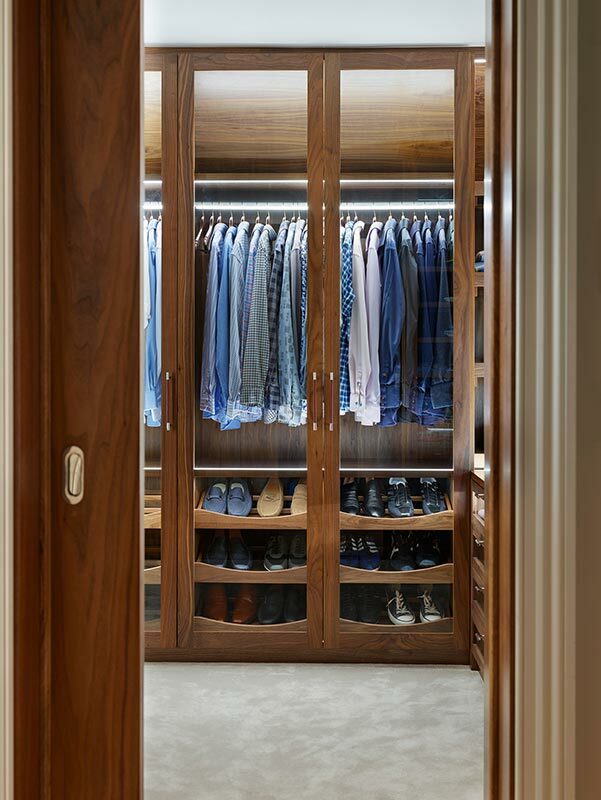 Bespoke, hand made, walk in wardrobe we designed for this client using a combination of walnut, mirror and glass. 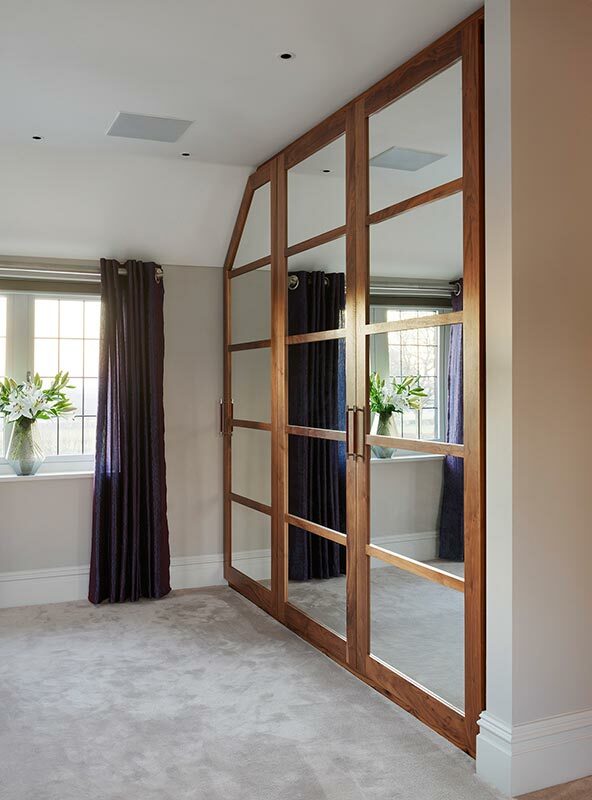 Hand made walnut and mirror wardrobes we designed for this luxury master bedroom suite. 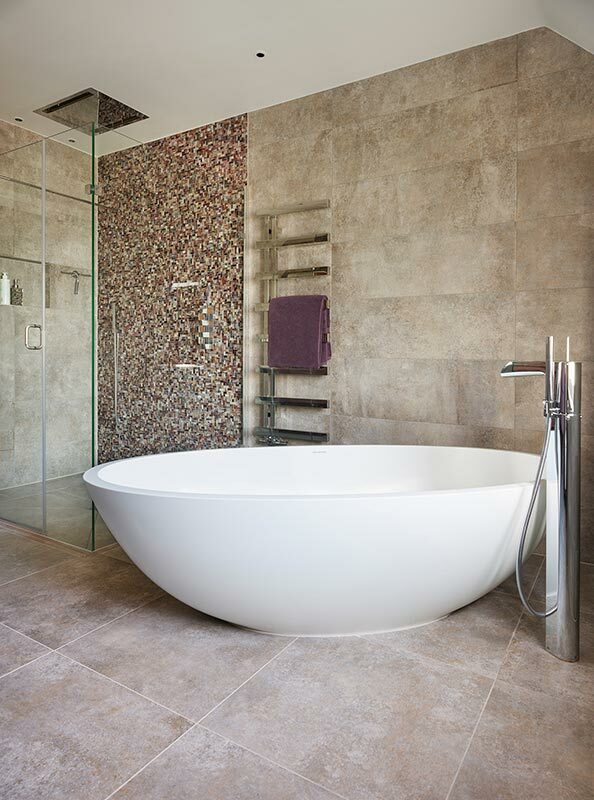 Beautiful heather and grey master ensuite bathroom. 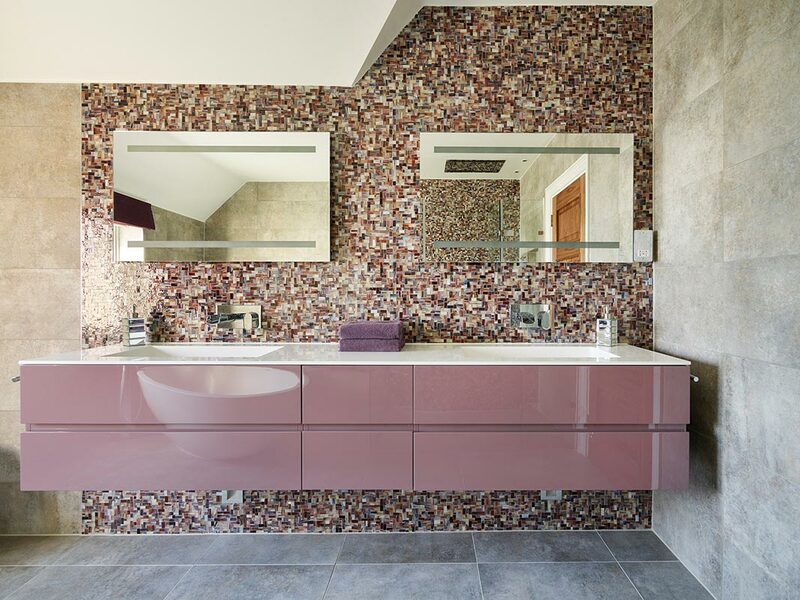 A fantastic contrast in textures with glass mosaic tiles, concrete tiles and gloss vanity units. You can just glimpse a reflection of the freestanding bath and shower enclosure opposite. Freestanding bath with floorstanding mixer. Large shower with rain shower and glass enclosure. 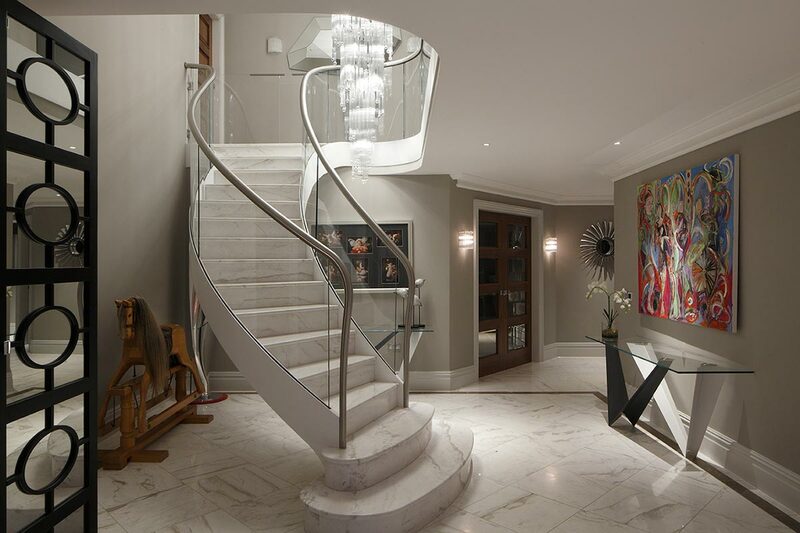 A peak through the front door reveals a marble floor and staircase with elegant glass chandelier. Bespoke freestanding wardrobe in a beautiful marble floored hallway. Designed by Ensoul. Interior design of an 8000 square feet family home with full turnkey furnishing and styling. Full design of every interior architectural detail and finish and a large number of pieces of bespoke furniture design. 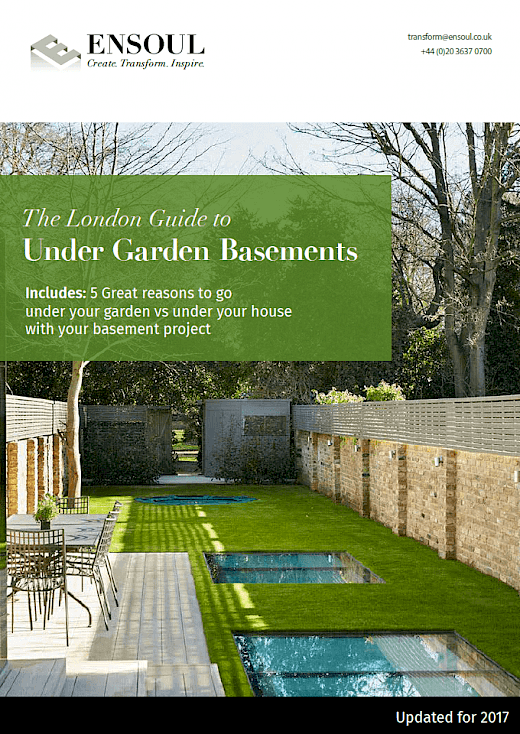 We also provided the landscape design which included a large outdoor kitchen, terrace, planting and lighting plan. 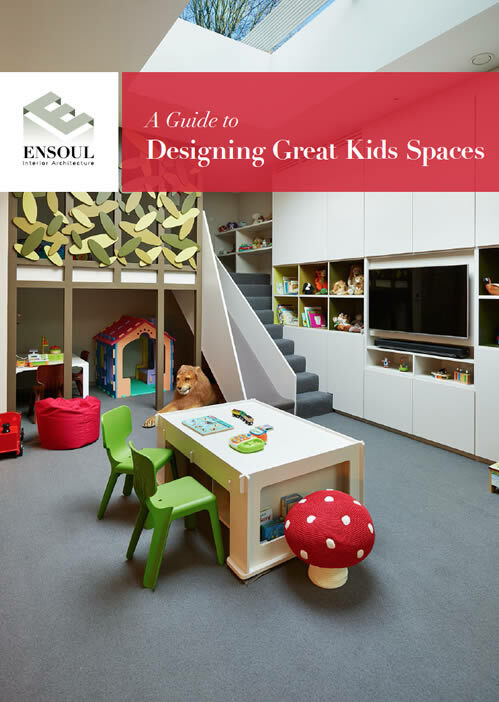 Ensoul designed every detail of this contemporary home working very closely with our clients who were refreshingly hands-on with all selections. 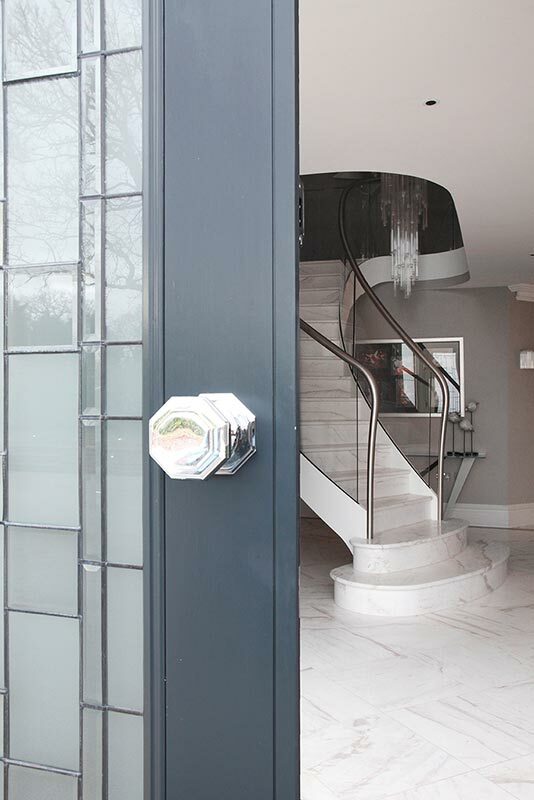 The brief was to deliver a contemporary home with wow factor and a few nods to traditional design concepts. Walnut, mirror and glass dressing room as part of the master suite. Bedrooms which all have their own personality but retain a cohesive flow. Includes two bedrooms with walk around beds that we architected into the floor. Bathrooms are all unique and feature beautiful tiles and mosaics. 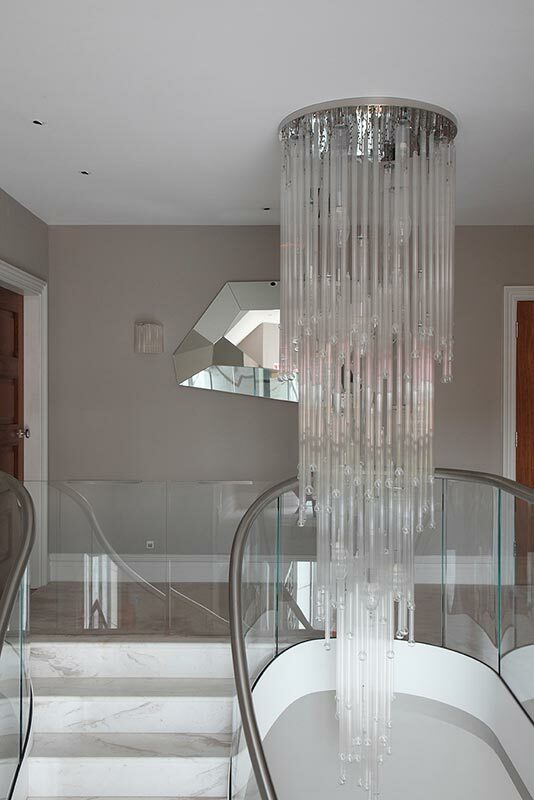 Marble entrance hall with bespoke Calacatta marble staircase and chandelier. 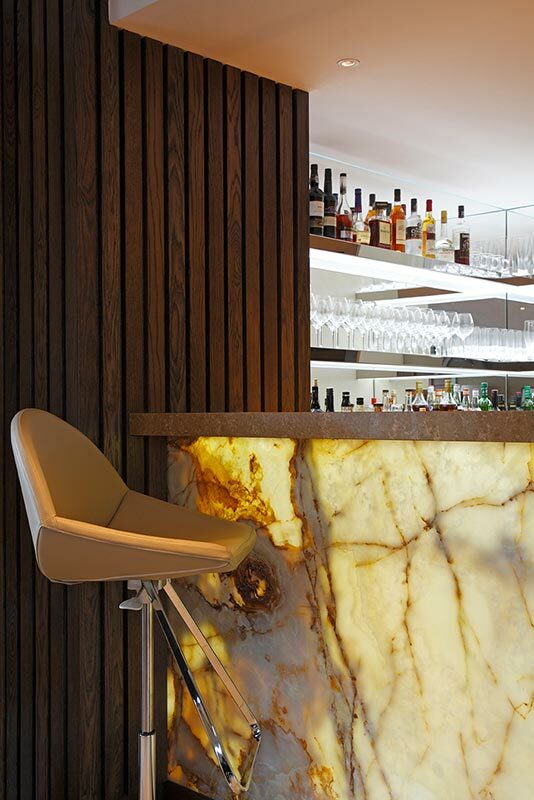 Back lit Onyx bar and oak panelling in the games / cinema room. Dining room with a 3.5m long bespoke Calacatta marble dining table which we commissioned. Large formal sitting room with feature wall showcasing a truly multimedia fire. Expansive outside terrace with large outdoor kitchen.